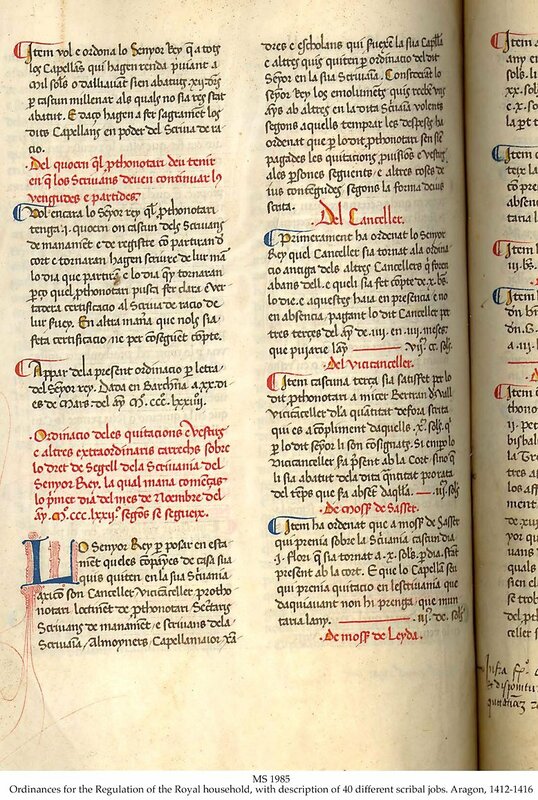 Description	 MS in Catalan on paper and vellum, Aragon, Spain, 1412-1416, 169+5 ff. (text complete), 34x23 cm, 2 columns, (21x15 cm), 38 lines in a rotunda Gothic book script of medium quality, titles in Gothic book script of high grade and very good quality, by the scribe Salvius Calsada, rubrics in red, large, up to 16-line, initials alternately in red and blue with contrasting penwork in purple and red with full marginal flourishes. Binding	 Spain, 18th c., gilt calf, sewn of 6 bands, gilt edges, red morocco spine label gilt. Context	 The text is recorded in 7 MSS. 3 are in Paris: Bibliothèque Nationale de France, 1 in Wien: Reichsarchiv. Provenance	 1. Gralta Family, Treasurers of Catalonia (ca. 1412-1416 -); 2. Marquess of Aitona, treasurer of Catalonia; 3. Frederick North, 5th Earl of Guilford (-1827); 4. R.H. Evans, London 8.12.1830; 5. Sir Thomas Phillipps, Cheltenham, Ph 6737, (1830-1872); 6. Katharine, John, Thomas & Alan Fenwick, Cheltenham, (1872-1946); 6. Robinson Bros., London (1946-1969); 8. Sotheby's 25.11.1969:464; 9. Joan Gili, Oxford (1969-1994); 10. Jeremy Griffiths, Oxford. Commentary	 The present text describes in extraordinary detail the organisation of a medieval Court under the different departments of the household, ranging from butler, cooks, and provisioners to the falconers, doctors, mace-bearers and keepers of the horses, with full descriptions of their jobs and their responsibilities. 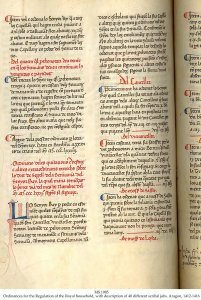 A considerable part of the MS concerns the work of the scribes of the various departments, such as copying documents, taking letters, keeping accounts, copying instructions, sealing, preparing vellum, ink and pens, in all ca. 40 different scribal jobs. The present text is a major source to the knowledge of the medieval scribe.